Producing a flawless kale chip might seem impossible, but we have suffered through batches of soggy, brown or burned kale chip experiments so that you don’t have to! Here’s how to produce the perfect crispy, green, salty kale chips for a healthy chip alternative. Kale has one of the highest nutrient-per-calorie densities of any vegetable which explains it explosion in popularity as a proclaimed “superfood”. So, here’s a simple a tasty way to pack more of that green goodness into your everyday diet! Tear kale leaves off the stems by holding the base of the stem with one hand and pushing upwards along the stem to slide off the leaves. Put the leaves into a mixing bowl and drizzle over the olive oil. A tablespoon might not seem like much, but trust us, it’s all you will need! Massage the olive oil into the leaves using the tips of your fingers. Make sure the leaves are completely coated. Evenly spread kale into a single layer on a sheet of baking paper. This is important – if you just pour the kale into a thick layer on the tray then they won’t crisp up properly. Place baking tray into the oven. Make sure you rotate the tray halfway through to ensure even baking. 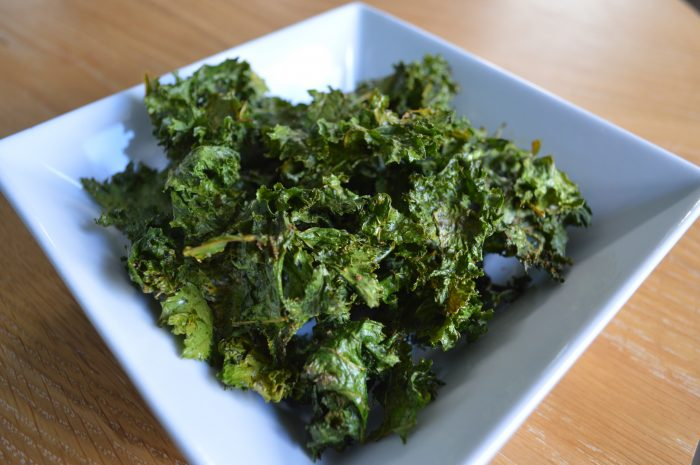 We have found that baking kale chips on a lower heat for longer is the secret to the tastiest chips! It should take 20-25 minutes, depending on your oven. Take kale chips out of the oven and sprinkle over the rock salt. If you want to add a bit of extra flavour to your chips, try sprinkling over some paprika or cumin before you put them in the oven.